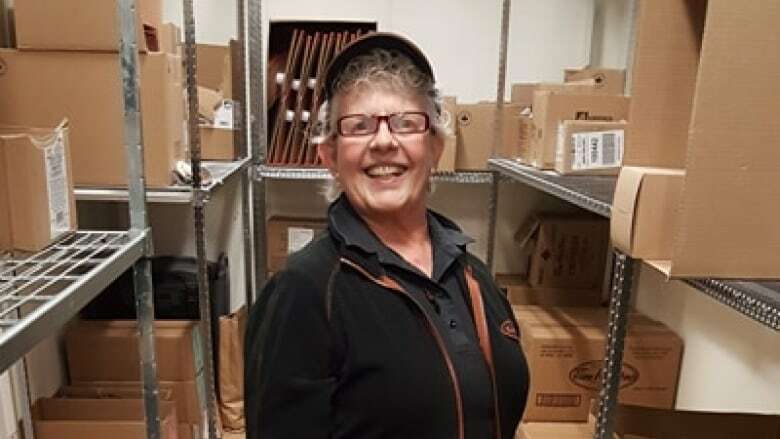 As some Tim Hortons locations in Ontario deal with massive public push back for cuts to employee benefits, a 68-year-old employee in Kirkland Lake is saying it might be a good time for people to sit back and wait for the dust to settle. 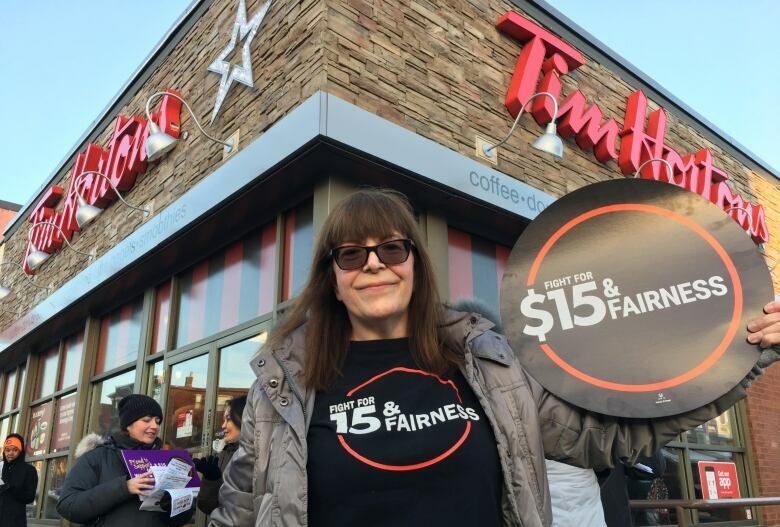 Donna Cozac, who has been a Tim Hortons employee for the past seven years, told CBC News that she's had to break the news to concerned customers: besides minimum wage increases, nothing else has changed — at least not in Kirkland Lake. 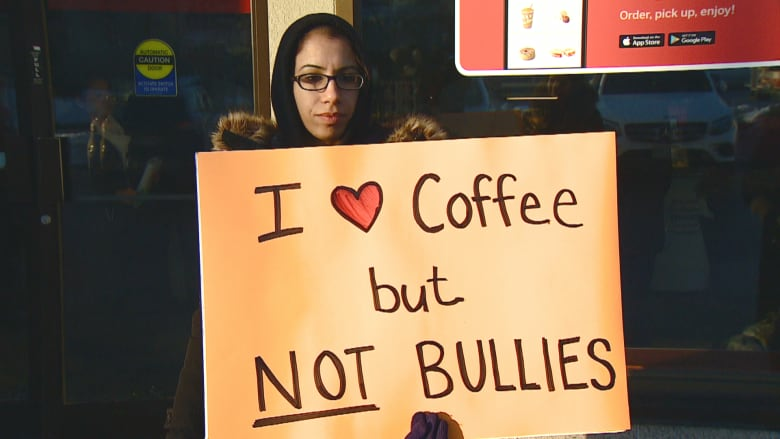 Earlier this week, protestors demonstrated outside of Tim Hortons in Toronto, Coburg, Whitby and Hamilton. "Because of all the negativity, because of Facebook, and all the stories on there, everyone, all the customers think it's happening at our location as well," Cozac said. "That's what they think. We have a lot of conversations with the customers to explain that's not the way it is at our Tim Hortons." No protests, no boycotts, no traffic jams in Kirkland Lake. Cozac said both store locations in the town of 7,900 were busier than usual Tuesday. And as for owners clawing back paid breaks or benefits, Cozac said that's not what employees in Kirkland Lake are seeing. "We did lose our 15 per cent discount Jan. 1, which isn't really a big deal because I don't have time to eat while I'm working," she said. And Bozac said Gord Sinclair, who owns both locations in Kirkland Lake, is a fair player. "You have to understand, he has to pay all that extra money. It's like the increase was forced on [owners] and they have to do something to compensate. [Sinclair] hasn't forced anything on anybody." The biggest change the employees dealt with recently was the loss of their paid breaks, which happened over a year ago. "Gord called us all in the office, explained it to us, and gave us all a raise to compensate us," she said. "We lost half an hour of time — two fifteen-minute breaks. He took it away because it was costing him a lot of money, and found out he didn't have to pay for it. But he gave us a raise." As for the flood of angry customers threatening to boycott the chain, Cozac says they reacted too soon, and without having their facts straight. "I think everybody had the wrong reaction," she said. "Everybody has their stories all wrong. I think everybody needs to take a deep breath and let it go and see how things work out."